Recently, I have noticed that any cooking recipe that I find on the internet is either not rated or rated very highly (between 4 and 5). I did a quick check of the data to confirm my suspicions. On 2 of the top cooking websites (allrecipes.com and recipezaar.com) I polled the recipes that had exactly one rating. On allrecipes.com 75% of recipes were rated 4 or 5. On recipezaar.com 91% of the recipes are rated 4 or 5. 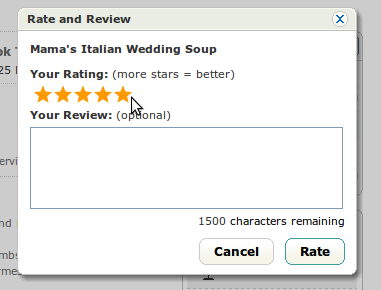 Neither guides the user as to how to rate the recipe or what the rating even means. Am I rating the quality of food, the clarity of the instructions, how tasty the image looks, etc? It is not surprising that there is a correlation between recipes having a image and having a higher rating. These web properties don’t want a more even distribution of the ratings. They want to be the best place to find recipes, or at least have that illusion. This entry was posted in statistics. Bookmark the permalink. Post a comment or leave a trackback: Trackback URL. You have to rate it twice. 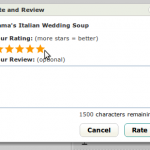 One rating for the recipe descripton, pictures etc…. and one rating for the prepared product, which you created with this recipe. This is the only think to avoid confused user. In the “recipes that have images” tables, the first two columns are flipped, and for all the tables, maybe “number or ratings” should be “number of ratings” (I’m not sure). @restruct I just fixed the tables. @manuel Interesting idea. It would be interesting to implement it while keeping things as easy and usable as possible. 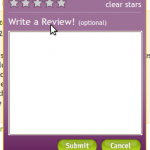 Why not just get users to rate each aspect of the recipe seperately, than aggregate the data into an overall rating. I agree with John. You could rate tastiness, readability, difficulty, etc. like people can rate clothes of size/fit, material, style etc. on some sites. Rating recipes is difficult because a talented cook could make it amazing, while and untalented cook like myself can ruin it, even when it seems impossible. 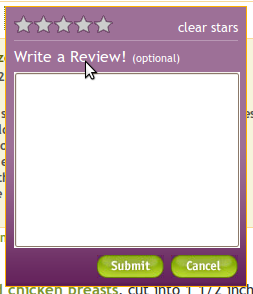 Several ratings on different aspects would be very useful. I like the idea of then combining the scores to make an average, but I can see why others might not like that idea. A delicious recipe could get a low rating because it is just very difficult. I review recipes at RZ or food.com (stupid name) frequently–why would I make something if I didn’t think it would be okay or very good in the FIRST PLACE? What experienced cook is going to waste time and money on a recipe they are certain they would NOT like? I would think most cooks feel the same way I do. And I DO review new recipes there too but am very careful. 2. Interesting idea about standardized rating systems, and also about rating the various aspects of a recipe. These systems could be designed, but I can’t imagine everyone agreeing on what the stars should mean, or imagine them being implemented across the broad spectrum of internet recipes.